The Government is consulting on the review of various laws that licence activities involving animals. ** This includes reviewing the law on the sale of pets and Cats Protection very much welcomes the review. 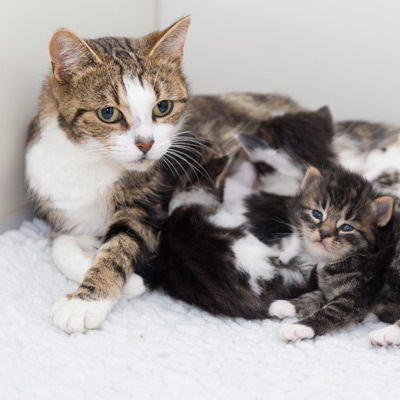 The Pet Animals Act 1951 is now over 60 years old and it does not adequately reflect the modern reality that thousands of kittens and cats are sold online by private sellers, often operating a business from a domestic residence and with poor welfare. Princess and her kittensWe agree with the Government who state in the review proposals that “all domestic commercial pet sales must be licensed”. Cats Protection wants better safeguards for the commercial sale of all types of cats across the board whether they are non-pedigree ‘moggies’ or pedigrees (estimates suggest only 10 per cent or fewer cats are pedigrees). Our concern is about those that repeatedly breed for sale irresponsibly, putting money before welfare and without the safeguards that pet shop licensing can provide. We know that there are responsible sellers out there and that good practice and high welfare standards exist, particularly within membership organisations like the Governing Council of the Cat Fancy (GCCF) that register pedigree breeds and advise on welfare. A prohibition on sales of kittens under eight weeks. Animal Welfare Team, Area 4B, Nobel House, 17 Smith Square, London, SW1P 3JR. Share your support by sharing this page via our social media buttons below. Please mark the subject or header of your email ‘Cat/kitten sales'. Adding details of your own experience and examples showing why you think the law on pet sales needs changing is especially helpful. Every email response is read by the Government and goes towards total responses. No personal names, addresses or other details will be included in the summary of responses published by the Government. Please send in your views before 12 March 2016. It’s a real opportunity to change the law for the benefit of cats and kittens. Every single response counts! Thank you – together we can create a better world for cats.